During its first year as presenting sponsor, the representatives of BlackVue, the dash cam brand designed and manufactured by Pittasoft in South Korea, had the chance to be introduced to great personalities from the drift scene. Chief among them was Ken Gushi, driver of the number 21 Toyota 86 for GReddy Racing. To those who follow the driver, the move will probably not come as a surprise. 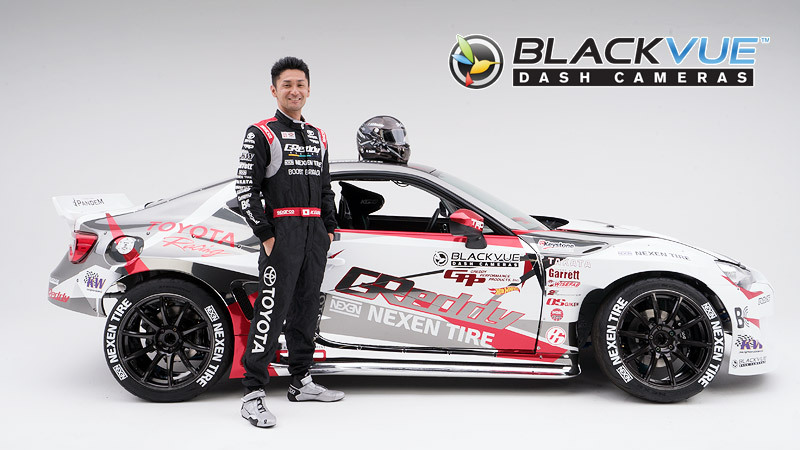 Since the beginning of the 2016 season, Ken Gushi expressed a personal interest in BlackVue dashcams. That proved a wise move. A few weeks after equipping his street car, a driver speeding in an emergency lane drove past Ken’s vehicle, smashing his side mirror to pieces. The whole scene was caught on both the rear and front cameras of Ken’s BlackVue, helping him expedite the insurance process, and soon his footage was going viral on social media. Ever since, a BlackVue can be found in his personal vehicles and he even went as far as equipping his entire family. Determined to prove its dedication to the US market, BlackVue decided to partner with the Formula Drift Championship as the presenting sponsor and official dashcam. The sponsorship is not only a way for BlackVue to support a hot automotive event series, but also a venue to showcase its connected dashcams and enhance the fans’ viewing experience. With networked BlackVue dashcams streaming video from the competitors’ cars, fans are able to ride along their favorite drivers in real time from the free BlackVue app. As a technology early adopter, Ken Gushi quickly saw the potential in partnering with BlackVue to bring new viewing experiences to his fans. The company also found it a great opportunity to explore new ways to use its Cloud-connected dashboard cameras. On the occasion of the first event of the 2017 Formula Drift season in late March in Long Beach, BlackVue worked with Ken Gushi and GReddy to establish a new first for the dashcam brand: the live streaming of dashcam footage to the driver’s Facebook account. “It is a pleasure to work with Ken and the GReddy team. They are always ready to experiment with new features, and Ken was very receptive to the new Facebook Live feature, enabling us to successfully demonstrate a new facet of our dashcams” said Jeremie Sinic, Marketing Team Manager for BlackVue. A month later, the Facebook Live streaming feature was just made available for iOS and Android mobile devices via a BlackVue app update.